Like a mutant monster in a B-Grade science fiction flick under attack, the besieged local daily fishwrap is flailing desperately as it stumbles towards its ultimate destiny. This death won’t be quick, and, using the vernacular of its militaristic editorial ancestors, there is likely to be a lot of collateral damage along the way. The staff at the paper now seems to have realized that their new overlords could care less about the actual practice of publishing. The new owners –Platinum Equity– have continued shrinking the payroll and hired a “journalistic mortician” to oversee the newspaper’s operations. The top two stories of the UT office building in Mission Valley are to be vacated so they can be leased, and it’s no secret that Platinum would like to sell off the property, which it acquired for about 40% of its accessed $90 million value. In fact, the acquisition of the U-T was never about the newspaper; it was an opportunity for a group of smart investors to grab some prime real estate at firesale prices. We still have ink. And while we’ve hardly been wary of spilling it before – we’ve done lots of tough pieces on local governments and elected leaders over the years – I believe we’re more prepared than ever to use it. We read the papers too, you know. People claim we’re dying. We’re dead. We’re irrelevant. My reaction: Try us. C’mon. The “watchdog” articles in question here appear to be part of larger strategy, one that’s as old as yellow journalism: demonize a group or class of people, inferring that this group is a threat to the lives of ordinary citizens. In the case of the U-T, the “demons” are now trade unions. By nurturing this bogus threat, the paper hopes to overcome its past reputation as a “lapdog” for the local gentry. Now that there are no longer communists supposedly massing just over the border, and it’s political & financial suicide to ignore or disparage Latinos, unions make for a very convenient target. In the most recent stories about City employees, the paper took public information (names & salaries) and presented it in a manner designed to paint those employees in the most negative manner possible. This is the “tar & feathers” of the Union-Tribune’s mob journalism. As for the defensive musings of Mr. Stetz, he’s easily dismissed as either a fool or a tool. 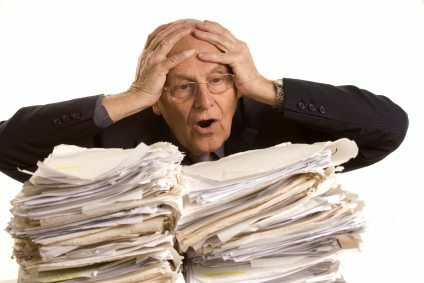 Disclosure time: It’s safe to say, like many people, that I have misgivings about what unions do and don’t do–see our coverage –but this demonizing crap is just beyond the pale. ALSO, Larry Remer & this author worked together back in the days of the San Diego Door. What’s true about trade unions is that they do constitute the best organized and funded part of the Democratic Party. And, let’s face it, things aren’t so good for the U-T’s preferred Republican flavor of politicians these days. So the secondary objective of all this bashing over at the U-T is like a rear-guard action, buying time until the circular firing squad mode of the GOP winds down. The point man for keeping that Republican flavor going on the editorial pages at our daily paper is one Chris Reed. He spent his formative years undergoing ideological training at The Orange County Register, joined the UT in 2005 and pens the paper’s online sop to wingnuts entitled “America’s Finest Blog”. Because I’ve been writing so much about public employee union power, whether it’s in the Legislature or San Diego Unified, I’ve gotten quite a bit of blowback from people who accuse me of being pathologically anti-union or exaggerating union responsibility for governmental problems. I’m not pathologically anti-union. I belonged to a union at my first daily newspaper. I wrote relatively little about unions during my stint as a metro columnist in the Inland Empire from 1995-1998. While op-ed columns editor, blogger and weekly columnist at the O.C. Register from 2002-2005, however, I began writing about unions more as the extent of their power in Sacramento became obvious. Now it’s pretty much topic no. 1 among all fiscal conservatives in this state. I absolutely have sympathy for individual public employee union members who feel singled out and put upon by the newly intense criticism they’re hearing — if, that is, they oppose their union’s aggressive attempts to manipulate elected officials. But if union members support what their bosses are doing, sorry, no sympathy here. Oh, and some of his best friends are probably union members, we bet. Finally, we arrive at the papers’ latest flailing, aimed at the weekly San Diego Reader. If you had any doubt that things are bad down in Mission Valley, this latest salvo should be the icing on the cake. 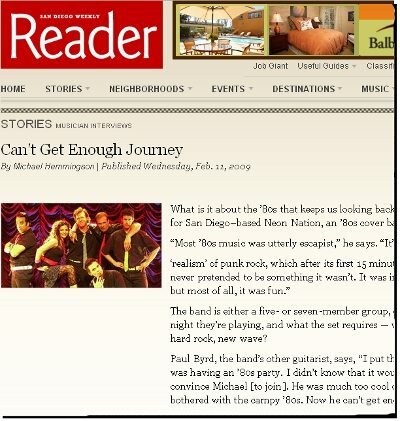 The powers that be at the U-T parent company are threatening to sue the San Diego Reader, a weekly publication popular for its calendar, cultural coverage, long-winded features and gossipy columnists. The Readers’ large circulation is, perhaps, the strongest testimonial to the many failings of the U-T over the years. The papers’ advertising to content ratio simply puts the daily paper to shame. It’s not that the Reader is particularly progressive in any sense of the word. It’s just that the U-T has failed so abysmally over the years that local advertisers have had no choice but to look elsewhere for a “platform” that was more palatable for readers under 65 years of age. 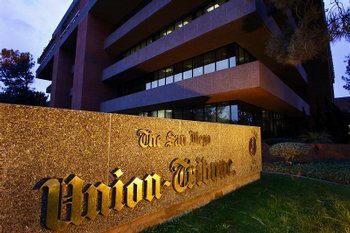 Several ex-Union-Tribune employees have found homes at the paper. And, let’s face it, a large number of the recently discharged U-T employees are less than happy about their situations. So the Reader has run a lot of pieces shedding insight on the internal melt downs at the daily. It’s been like shooting fish in a barrel. A front page trumpeted expose about Platinum Equity’s principals that appeared in the Reader last spring was much ado about nothing. It focused mostly on the immigrant backgrounds of the brothers Gore, reaching for any hint of scandal possible. When I read it, I (almost) felt sorry for Platinum’s owners, given that their place of birth seemed to be the most substantial allegation that the author unearthed. Last month, the business/financial TV station CNBC quoted from two civil lawsuits, filed within the past three years, that charge Platinum Equity with sexual harassment, with giving special consideration to female employees who sleep with executives, and the like. There were settlement discussions with two of the plaintiffs, and both suits were dismissed. But Platinum won’t say if there were settlements with the female plaintiffs. (See adjoining column.) After getting the voluminous records from the lawsuits, the Reader asked Platinum’s public relations executive, Mark Barnhill, for a response. But Beverly Hills’ Platinum Equity, the buyout firm that recently acquired the Union-Tribune, has hired Mad Dog Singer to fire off a letter to the Reader…. Among many things, the letter warned that if significant facts were omitted from a Reader story or if the story implied that the charges were true, Platinum would file a defamation suit “giving rise to potentially astronomical damages.” Warning of “immense monetary damages,” Singer’s letter admonished, “You proceed at your peril.” At the top of the letter were these words: “CONFIDENTIAL LEGAL NOTICE. NOT FOR PUBLICATION OR OTHER USE.” In a number of instances, the Reader has found, Singer’s threatening letters have been published despite his warning of a possible copyright violation. The letters we have seen contained the same language – words such as “malicious,” “defamatory,” and “violation of Copyright Act,” for example – that Singer uses in his letter to the Reader. The letter sent to the Reader (click on the link attached to the word “response” in the paragraph above) is an all-time classic attempt at legal itimidation. In the event that the threat isn’t an empty one, the discovery phase will certainly yield a wealth of information about the inside workings of a big time equity group. But it’s much more likely that the U-T will be folded, probably sooner than later. meanwhile the U-T continues to trumpet the big shiny building projects that San Diego taxpayers have and are expected to finance, like a new hotel as part of a convention center expansion; the schoolbrary, the airport boondoggle, etc. i guess it’s okay to give out tax dollars & benefits that amount to corporate welfare as long as a smattering of (mostly) minimum wage jobs are promised. mr fresh – the so-called “schoolbrary” is the main downtown central library that we have been promised for many years. we need it, so please don’t include it in this broad sweep (just because the voiceofsandiego doesn’t like it, doesn’t mean that it is bad FYI). it’s not the library that’s a bad thing. it’s the high school part of the deal that’s screwy. there is no parking down there for a high school. and the elementary school that IS needed in this part of san diego isn’t going to get built. i get it that “they” say that if the school isn’t part of the deal, then the funding doesn’t exist…. but why? This AM outside Jungle Java there were no U-T copies in the machine. In their place was the LA Times. Uh-Oh Spaghetti-o’s…..
BTW did anyone check out the “camper” markings on top of Jungle Java’s tent? Some dude was asleep up there this AM. The guy took a dump in the back, too. Poor Denise (morning girl) was livid!